Take control of your homemaking - once and for all! But now that it's been over four months of using this system what do I think? Has the newness worn off? Has it made a difference? I'm still a BIG fan of this system. 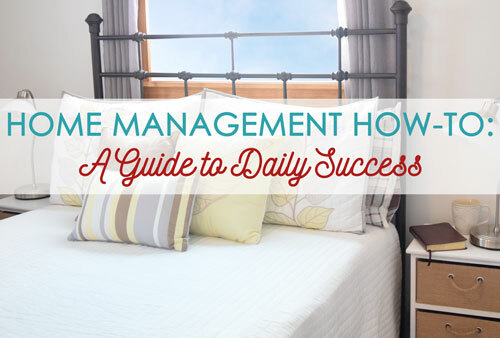 It's so simple - each area of home management gets its own day. No trying to get a bunch of freezer cooking done but also panicking that the bathrooms need a scrubbing. Each area has a day and I can ignore it the rest of the week. Freedom, baby! And even more importantly is the scheduled rest day. I don't need to feel guilty when I want to spend all of Sunday lounging and soaking up family time because it's planned! So if I already ranted and raved and sung this courses praises back in March why am I back at it now? I'm so glad you asked! Registration for this course originally closed on March 31st while Stacy and Barry took a break to evaluate how things were going and see if the course was something that they should offer again. The response was a resounding, "Please bring it back!" and they've opened registration again beginning July 1st - meaning it is open now! This course is for anyone in any walk of life. Working, stay at home, married, single, kids, no kids, and everything or every variation there of. I make the days fit our life, rather than the days controlling my life. If we need to go somewhere I can adjust Errands day or make it our catch-up day. My home management schedule does not rule my life. No guilt about getting EVERYTHING done every day. I usually didn't feel guilty before this system but occasionally I'd look around and think I should have done more. Now I know exactly what needs to be done each day and I don't need to give any thought to items on my list for another day. I'm actually getting more done! There are tasks I'm doing on a regular basis now that only got done once in a while before. Washing the kids' bedding? Only when I remembered. Now it's part of laundry day every other week! Wiping down fridge shelves? Um, when there was a spill. But now I try to wipe down one each week so none of them get terrible. A planned rest day. Need I say more? If you've got a home management system that works for you - FABULOUS! I love that you have found a way to manage it all. I wish I had figured it out earlier but I was totally winging it and it was not working. I needed someone to basically take my hand (and listening to Stacy in her wonderful southern accent made it so much better) and walk me through this whole plan so I could better handle all that comes with managing a home. I only wish this course had come along YEARS earlier! Ready to dive in? Head here and choose the package that is right for you. Then come back here and let me know you signed up! I can't wait to cheer you on in your journey to easy home management. Do you have a home routine for staying on top of tasks? How did you create it? Are you looking for a way to manage your home? 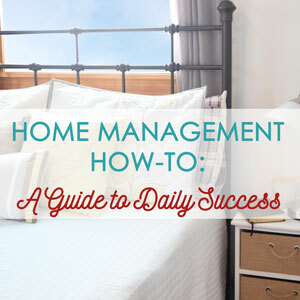 Have you taken the Home Management How-To course already? What are your thoughts?